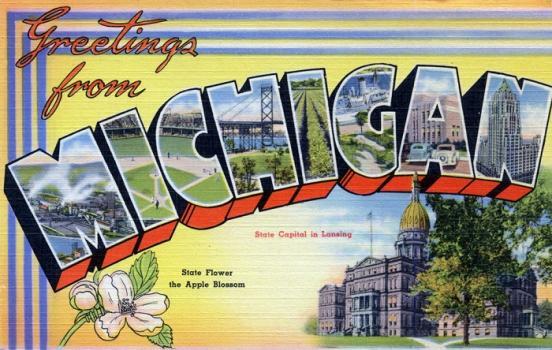 Michigan is one nation’s most scenic states. Four of the five Great Lakes surround the state, highlighting more than 3,200 miles of pristine coastline, Mackinac Island is one of the most visited attractions in the region, and Tahquamenon Falls, the Keweenaw Peninsula and Brockway Mountain Drive, the Porcupine Mountains and Lake of the Clouds, Isle Royal National Park, and Kitch-iti-Kipi round out the state’s seven “natural wonders.” Aside from beautiful scenery, Michigan is also home to one of the nation’s most infamous cities—Detroit. Despite any negative attention the city may have received over the years, Detroit has an exciting art and culture scene that boasts several major art museums, and dozens of alternative museums and galleries. The Detroit Institute of Arts Museum and the Museum of Contemporary Art are two of the city’s top art museums, and The Scarab Club and the Elaine L. Jacob Gallery are a few of the city’s most popular artists clubs and galleries. Art museums, galleries, performance venues, and art & design centers can be found in other cities as well including Ann Arbor, Bloomfield Hills, Grand Rapids, Warren, Sterling Heights, Lansing, and more. The Great Lakes State also has an outstanding collection of colleges and universities that offer top-rated art programs for aspiring artists of all kinds. Just a few include The College for Creative Studies in Detroit and the University of Michigan at Ann Arbor. These schools are just a small sampling of the state’s more than 100 Title IV degree-granting colleges and universities. Nearly 700,000 students are enrolled in colleges and universities across Michigan and thousands are enrolled in their art and design programs. More than 4,500 art and design majors are enrolled in the state’s top art schools alone. Scroll through the list below to take a look at Michigan’s best options for aspiring artists and some of the programs they have to offer. Michigan is home to more than 48,000 Arts, Design, Entertainment, Sports, and Media (ADESM) professionals. They earn an average annual salary of $47,650 per up slightly from $46,960 in 2009, when the state was home to 53,500 professionals in this occupation. Of the more than 48,000 salaried ADESM professionals living in Michigan today, more than 5,500 are graphic designers averaging $47,940 per year, nearly 1,000 are art directors earning an average annual salary of $74,250, nearly 300 are multimedia artists and animators averaging $50,740 per year, 230 are fine artists averaging $60,260 (2012, latest figures) per year, and 140 are craft artists earning $34,260 per year. The states with the highest employment levels for ADESM professionals are California, New York, Texas, Florida, and Illinois. While Michigan did not make the list of top five states with the highest employment levels for ADESM professionals, with 2,250 ADESM professionals, the “Balance of Lower Peninsula of Michigan” nonmetropolitan areas holds the number three spot on the list of top five nonmetropolitan area with the highest employment level in this occupation.